After researching dozens of online platforms and personally testing the most highly recommended of them, we strongly believe Capital.com is the best online trading platform in India. With zero fees on intra-day trading, a lightning fast web platform and their proprietary Negative Balance Protection, Capital.com gives you the best chance at financial success with a clean, easy-to-use interface. The fact that you’re reading this tells me you know how tough it can be to find a good online trading platform in India. There’s so much information out there that just getting started with a stock broker in India can be overwhelming. That’s why we wrote this guide: to cut through all the nonsense and give you a clear, pointed answer of who you should open your trading account with. We’ve researched dozens of online trading platforms from all over the world, tested many of them, and have paid particular attention to local Indian brokers as well. There’s one group of people that the recommendations in this guide are not appropriate for: absolute beginners. If you don’t know what “forex” means, you’re in the wrong place. I can’t recommend anyone lacking a base understanding of financial knowledge—whether you’ve gained that understanding through your career, courses at university, or by teaching yourself online and with books—to start trading, since the odds are very high that you’ll lose money. If you’re looking to learn about online share trading in India for beginners, or you don’t know the basics of trading equities, forex pairs and CFDs, go do your homework and come back later. You’ll be in a much stronger position when you’re ready to actually start trading, and you’ll be glad you waited. Compatible With India: I don’t mean that the platform has to be exclusive to Indians when I say this. I mean that it needs to work extremely well with existing Indian infrastructure. For example, the platform needs to accept the most common funding methods in India, allow Indians to sign up and start trading with ease, and offer customer support in timezones that match with the waking hours of India. Commissions & Fees: We looked at commissions and fees on everything: funding your account (using various methods), per-trade fees, bid-ask spreads, overnight fees, withdrawal fees, monthly or annual membership fees, and any other miscellaneous fees we could find that would be relevant to a regular user. Some platforms had extremely high fees (eg. $200 USD or ₹10,000) to solve very unlikely circumstances, but we opted to ignore these fees, since 99+% of users would never find themselves in those situations. Signup Speed: We had multiple Indians, plus multiple foreigners people living in India (originally of various nationalities), sign up for each of the platforms and logged how much time it took them to be approved, from when they first reached the website to when they were in a position to make their first trade. After looking at all of this data, both qualitative and quantitative, we identified three online trading platforms that stood out from the rest. None of them were India-specific platforms, since our in-depth research process told us that none of the local competitors were quite as good as these international heavyweights. However, because so many people in India really love some of the local players—Upstox, Zerodha, India Infoline (IIFL), ICICIDirect, Sharekhan, and Market Hunt—we’ve included side-by-side comparisons of each of those below. Some of the costs included below are in $ USD, since that’s the currency these online trading platforms use. A quick look at this chart makes one thing extremely clear: Capital.com is the best online trading platform in India. With an easy-to-use web and mobile interface, extensive (and free) funding and withdrawal options and zero fees on intra-day trading, it’s an ideal choice for most people. Ease Of Use. Anyone who has used IBKR knows that their interface is powerful, but far from intuitive. The app often has users going in circles, and doesn’t make it clear how to perform simple transactions like buying and selling an equity. The web interface is no better. By contrast, both Capital.com’s app and web interface are extremely intuitive and easy to use. Interactive Brokers is a fine option, but it can be both difficult and expensive to fund your account with them, since you can only pay with a bank wire. This is a particularly big problem for Indians, whose banking infrastructure is quite different from those of the United States and much of Europe. Plus, IBKR’s clunky, non-intuitive interface feels archaic next to Capital.com’s sleek, modern user experience. We’re very confident that most people will prefer Capital.com over Interactive Brokers. 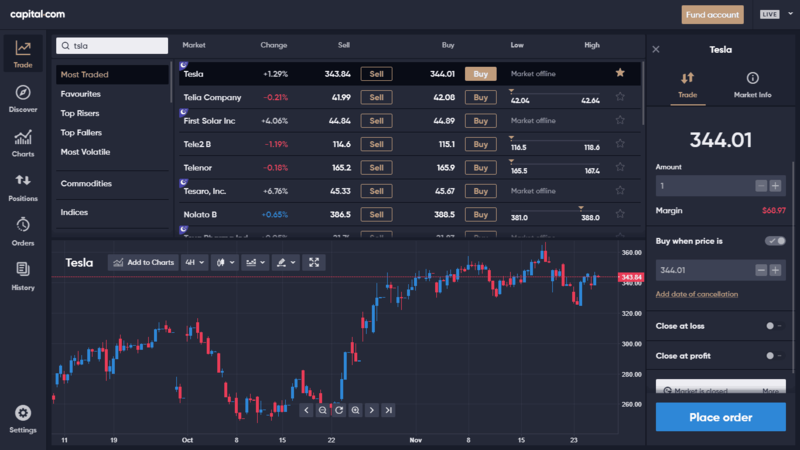 This is how Capital.com’s trading platform looks, very similar to a Bloomberg terminal. Much More Accurate Pricing. Our research showed again and again that nearly all of the Indian trading platforms offer less accurate pricing (and larger bid-ask spreads) than the international platforms. This probably has something to do with currency conversion, since trading on U.S., European and Japanese markets while using rupees is going to be expensive. This is something most users overlook, but the small spread differences have a big impact on your profits over time. Zero Fees. Without exception, all of the Indian online trading platforms charge fees for items that Capital.com does not. For example, they all charge account opening fees and intra-day trading fees (see the chart below), while Capital.com never charges either. Better Interface. While some of the Indian trading platforms are reasonably well-designed, none of them come close to the clean, easy-to-use interface of Capital.com. This doesn’t mean that Capital.com is trading robustness for simplicity—it’s still more than powerful enough to do everything you want it to do. It means that the Indian trading platforms don’t have designs that are nearly as user-friendly as Capital.com, and that makes a big difference when it comes to making smart, successful trades. No Account Opening Fee: Sharekhan’s ₹750 account opening fee is one of the highest of all the Indian trading platforms, and it just doesn’t quite make sense. Why would any platform that wants to help their customers make money charge them so much upfront? By contrast, opening an account with Capital.com is completely free. Zero Intra-Day Trading Fees: Sharekhan charges 0.1% on all trades, including intra-day trades, which can add up quickly when you add on their moderately large bid-ask spread. In contrast, Capital.com never charges intra-day trading fees, which keeps your money in your pocket. 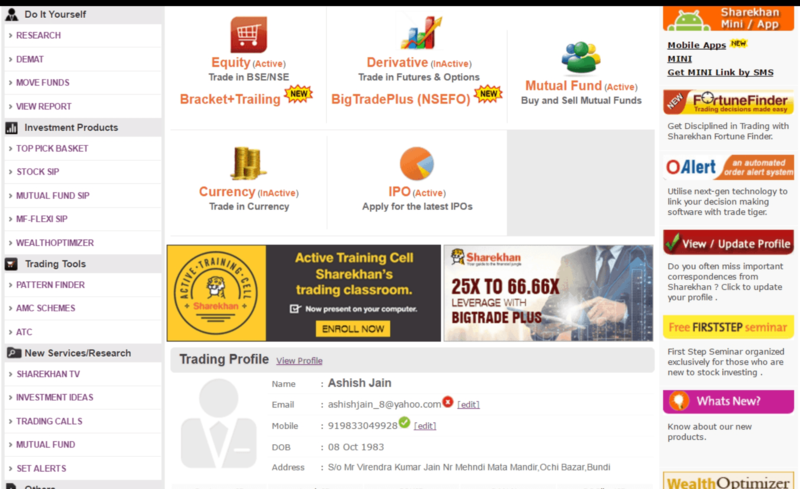 Far Superior User Interface: Fees aside, one big issue that Sharekhan users consistently run into is the outdated, clunky interface (see the photo below). The web trading platform looks like something from the 1990s, and the app is only slightly better. Capital.com, on the other hand, is sleek, user-friendly and easy to use from the get-go. If you’ve used Sharekhan in the past, switching to Capital.com will feel like stepping into a new world. More Customer Support Options: More and more customer service is being done over live chat these days, but Zerodha still hasn’t implemented live chat functionality. Zerodha also doesn’t have a toll-free support number, which sounds like a minor thing but can be important if you have an urgent problem to solve while you’re outside of India. Capital.com has live chat, offers local numbers in more than twenty countries around the world, and offers quick responses over email, too. Lower Fees Of Every Kind: Zerodha charges a ₹300 account opening fee, an annual ₹300 account maintenance fee, and a ₹9 fee for every transfer you make in and out of your account, which sounds insignificant but adds up quickly. Capital.com never charges any of these fees. 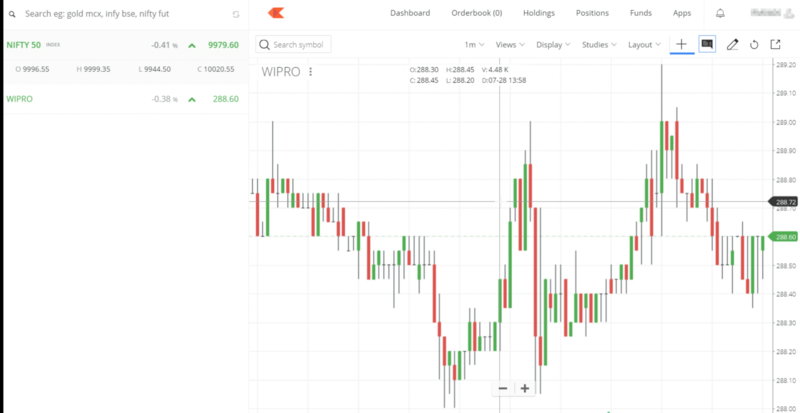 Superior User Interface: Zerodha’s user interface isn’t as bad as Sharekhan’s, but it certainly isn’t great, either (see the photo below). The app is just the same—not terrible, but certainly not fun to use. Capital.com’s user interface is much, much better. Zero Brokerage Fees: Upstox charges ₹20 for every transaction, even on intra-day trades. Capital.com doesn’t charge any intra-day trading fees, no matter how large or small your transaction is. Trading On Margin: One of the big benefits of Capital.com, which we cover in our in-depth Capital.com review, is being able to trade on margin. Trading on margin (also known as trading with leverage) allows you to multiply your profits by trading with money you don’t actually own. For example, you can trade stocks at a margin of 5:1, which means you can buy ₹5 worth of stock for every ₹1 you add to your account. Capital.com allows even greater leverage on other asset classes: commodities trade at 10:1, stock market indices at 20:1 and forex pairs at 30:1. Upstox doesn’t allow you to buy on margin at all, which means you’ll need to wait longer to make big returns. Zero Day Trading Fees: IIFL charges intra-day fees on every trade, some of which can be very expensive. For example, its Variable Brokerage Plan charges as much as 5% (2.5% upon opening a position, 2.5% upon settlement) on options, which is an extremely high fee. Its fees on futures (0.05% upon opening a position, 0.05% upon settlement) are more reasonable, but still higher than they need to be. Capital.com never charges any fees on intra-day trading. Far Superior User Interface: IIFL’s user interface isn’t quite as bad as Sharekhan’s, but it almost is (see the photo below). The app is a bit better, but still far from inspiring. I just can’t imagine using it every day without going a little bit crazy. Capital.com’s user interface is much, much better. Much Lower Fees: ICICIDirect’s account opening fee of ₹975 was the highest of all the Indian web trading platforms we looked at, and it makes you wonder why. Their 0.275% trading fee is also extremely high, and when you combine it with their bid-ask spread, seriously stacks the odds against day traders. Capital.com never charges an account opening fee or any intra-day trading fees. Far Superior User Interface: Just like IIFL, ICICIDirect’s web interface is pretty bad. It’s clunky, it’s slow, and it constantly tries to sell you irrelevant services like help with your income taxes (see the photo below). The mobile experience also looks like it was built ten years ago and never updated once. In the heat of a trade, when money is on the line, I just don’t have confidence that ICICIDirect’s platform will come through for me. Capital.com feels at least 20 years ahead when you compare the two. Market Hunt is another online trading platform that comes up quite a bit in online forums and reviews in India, so it’s worth mentioning here. However, just like many of the other platforms, Market Hunt charges higher fees than Capital.com and has an old-school user interface, which is shown directly on the company’s homepage and in the photo below. Not exactly user-friendly, is it? We can’t recommend Market Hunt over Capital.com. This is quite a revelation for India, where trading cryptocurrency is notoriously difficult. You can go through the process of signing up and verifying your account with one of the other Indian cryptocurrency exchanges—Zebpay, Unocoin, Coinsecure, and others—which can take days or more to get set up, or you can start trading cryptocurrency CFDs immediately with Capital.com. Margin Trading: Trade with leverage of 2:1, which allows you to invest twice the amount of money you actually have. That means that if a cryptocurrency jumps by 50%, your return will actually be double that, or a 100% gain. More Secure: Cryptocurrency trading comes with an inherent amount of risk, since you’re generally holding your crypto balances on wallets that you don’t wholly control. When you trade cryptocurrency CFDs, though, you’re actually trading an asset that’s backed by the various regulatory bodies that govern Capital.com, making the process much more secure and reliable. An incredible app: Of all the apps I’ve tried over the years, Capital.com has the best trading app hands-down. It’s both intuitive and powerful, and gives you AI-led suggestions to help aid you in your trading. I used to do 100% of my trading from my laptop, but more and more I now find myself buying and selling my positions from within the Capital.com trading app. You must reside in one of the following countries: Argentina, Armenia, Austria, Azerbaijan, Bahrain, Bulgaria, Cambodia, Chile, Croatia, Czech Republic, Denmark, Estonia, Finland, Georgia, Germany, Greece, Hungary, Iceland, India, Indonesia, Ireland, Italy, Kuwait, Kyrgyz Republic, Latvia, Liechtenstein, Lithuania, Luxembourg, Malaysia, Mexico, Monaco, Norway, Oman, Pakistan, Philippines, Poland, Portugal, Qatar, Romania, Slovakia, Slovenia, Sweden, Switzerland, Tajikistan, Thailand, The Netherlands, Turkmenistan, United Arab Emirates, United Kingdom, Uzbekistan. What About Forex Trading In India? Can I Trade Forex On Capital.com? Yes, you can absolutely trade forex on Capital.com. There are hundreds of forex pairs you can trade at a leverage of 30:1. For example, the EUR/USD forex pair trades at 30:1 (3.33%) leverage, which means you can trade $30,000 worth of it with just $1,000 in your account. However, in accordance with the FEMA Act under Indian law, Indian citizens are only allowed to trade forex pairs involving INR. How Does Capital.com Compare With Discount Brokers In India? We decided not to include Indian discount brokers in our comparisons here, since they offer a very different product that focuses much more on price and much less on quality of service and ease of use. On top of that, Capital.com’s zero-fee structure means you get the money-saving benefits of a discount broker with the intuitive interface and excellent customer support of an international, institutional broker. It’s the best of both worlds. For security purposes, your IP address needs to be in one of the countries mentioned above when you sign up for Capital.com. If you’re in India, you won’t face any troubles. If you’re abroad when you sign up, you can use a VPN to redirect your Internet traffic back to India or to somewhere in Europe so that you’re able to sign up. If you don’t do this, you’ll see a blank screen when you click on the Capital.com website. To sign up for Capital.com, you need to live in one of the ~50 countries mentioned earlier (India is one of them, of course). Foreigners living in India can also sign up for an account with Capital.com. Use a VPN to redirect your Internet traffic to India or one of those other locations.